Tracey H., of Ossineke, MI! Each month we will have a drawing for a free item(s) w/shipping for US residents only. This will vary from month to month, and will be listed here before each new giveaway begins. No substitutions. No cash value. Giveaway is for the featured item only. All entries must be received on the last business day of the month, by 10am Pacific Time. A name will be randomly drawn from all entries received, and posted here on our website. If you'd like to participate in our free contest, send us an email with your name and shipping address. Sending your phone number is optional, but gives us another way to contact you if we can't get a hold of you via email. We need this info, even if you enter every month. Once a winner is drawn, and confirmed, all entries are destroyed. To celebrate the addition of our new silver color, and the new beneficiary, Still Creek Ranch, we're giving a Hope Rope Halter™ for September's contest. 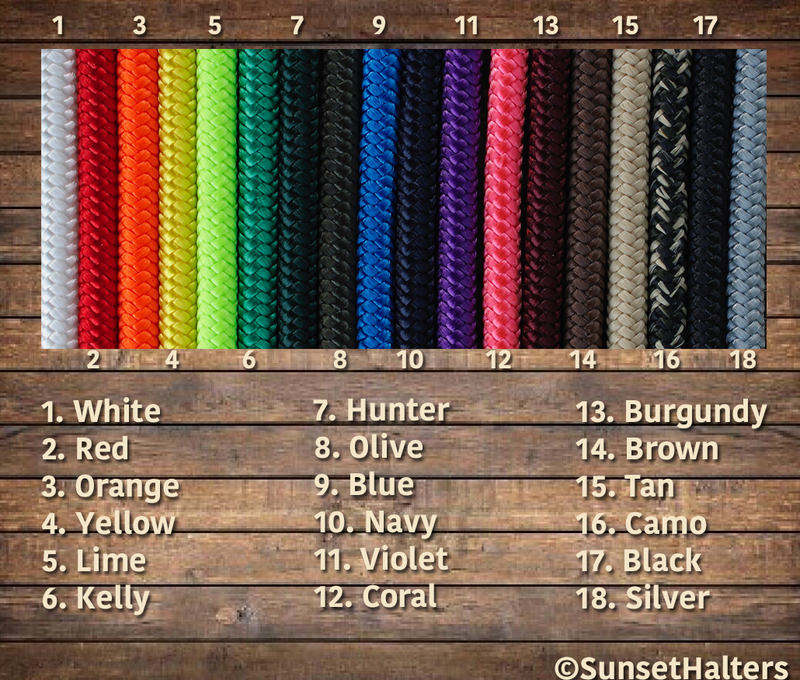 This rope is manufactured right here in Washington State, using premium polyester fiber. The halter is complete with a fiador knot at the chin, our special throat latch knot, and lover's knots throughout. In addition to the halter, the winner has the option of a plain noseband (shown), extra noseband knots, or a wrapped noseband. Winner chooses size, color and noseband type. As always, free priority shipping in the U.S.A. is included! No purchase necessary. Purchase does not increase chances of winning. Chances of winning depend on the total number of entries. Please limit one entry per household per month. Duplicate entries will be discarded- this includes using different emails for the same person/household. Open to all U.S. residents. IF you do not receive a confirmation email from us, we did not receive your entry-- please send it again. Your email, personal information or mailing address will never be spammed, sold or given away. It is required for notification of winning and completion of this contest only and will be destroyed after the contest. By entering, winner agrees to allow their name, city and state to be published as confirmation of contest's validity to visitors of this website. There are no strings attached to this contest. It is strictly for site promotion and to show our appreciation. ©Sunset Halters 1999-2018. All Rights Reserved.